The Ryukyu Shimpo conducted an attitude survey in November 2011 in order to gain an insight into the character of Okinawan people and to detect trends in society. This is the third of its kind after those carried out in 2001 and 2006. The percentage who answered, “I get along well or reasonably well with my neighbors” was 54.1%, down 8.4 percentage points compared to 2001 and 5.3 points down on 2006, indicating the quickening trend towards shallow relationships in the community. The figure for those who answered, “I can speak Shimakutuba or the Okinawan dialect” was 44.7%, down 11.1% on 2001, with the percentage for this answer falling below 50% for the first time. Particularly notable was that 90% people in their 20s and 30s said that they are not able to speak the language, indicating a critical situation on this front. The percentage of people concerned about the presence of U.S. military bases was 44.2%, up 9.7% compared to 2006. It has risen from fourth position to become the next matter of concern after low income, which attracted 61.1% of responses. With regard to neighborly ties, 38.9% answered “Only exchange greetings,” up 7.1 points compared to 2001, “Very little” was also up 1.5 points to 6.4%. Among the young generation in their 20s and 30s, the result combining the two answers accounted for 70%, which is radically different from those in their 40s. A total of 47.9% of people said that they took part in the community events and festivals “often” or “sometimes” which was down 9.9 points compared to 2001. On the other hand, people who answered that they “hardly ever” or “never” participate in such events increased by 9.9 percentage points. While 26.3% of respondents commented that they can understand but cannot speak Shimakutuba, 21.7% said they have some ability in the language, and 7.3% of people said that they don’t know it at all. There are significant gaps among the various age groups, especially with regard to the answer “I can both speak and understand the language.” The percentage is 86.8% for people in their 70s or older, 75.0% for those in their 60s, 51.5% for the 50s, 27.9% for the 40s, 13.7% for the 30s and 10.1% for those in their 20s. The answer “reduce” or “remove” the U.S. military bases reached 65.9%. With regard to the future political status of Okinawa, 61.8% want to continue its current status as a prefecture of Japan, 15.3% want it to be a special administrative region which includes the option to be an autonomous state, and 4.7% want independence. Pride in being Uchinanchu and towards Okinawan culture is about 90%, which remains as high as in 2001 and 2006. 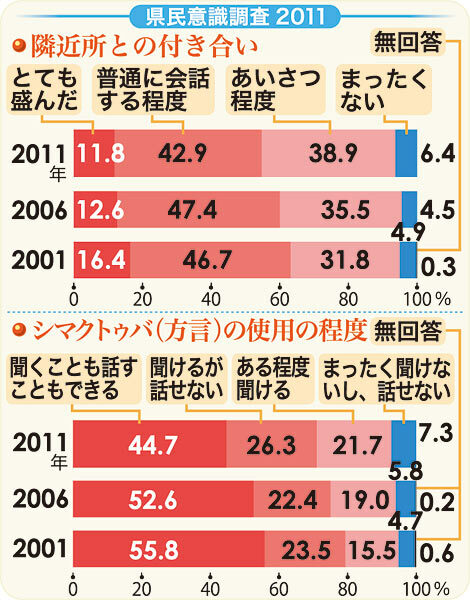 In the survey, 2000 Okinawan residents over 20 years of age were randomly selected from a list of eligible voters. Polltakers visited the 1137 people who responded and carried out interviews between November 11 and 24, 2011. The response rate was 56.9%.